This summer Second Nature is facilitating a program to help New England Climate Leadership Commitment signatories align their climate action efforts with their institution’s strategic priorities and mission. By helping signatories identify how mitigating and adapting to climate change contributes to executive level priorities, the Climate Leadership Alignment Initiative will demonstrate the value of climate action to meeting the mission of higher education. Many schools in New England are setting an example for the rest of the Climate Leadership Network by making sustainability and climate action explicit components of strategic planning and decision-making. To demonstrate how a campus can align climate action and institutional mission, I looked at Unity College in Maine, a small liberal arts school that calls itself America’s Environmental College. Unity is unique in that sustainability science is one of the six overarching themes in the school’s strategic plan. I asked Jennifer deHart, Unity’s Chief Sustainability Officer, what it means to work at an institution with an environmental framework and how this focus helps the school. “I think we attract a very qualified, committed and talented pool of faculty and staff because of our reputation,” says Jennifer. “We do find that efforts we are making, because of the way they are communicated and the audiences to whom we communicate, help us get recognition in regional media and among higher ed institutions. We still get inquiries about our divestment from fossil fuels and other sustainability decisions that we have made so we know there is continued engagement which is encouraging. The fact that we have a chief sustainability officer and we are happy with that role send a strong message to all our constituents.” Unity’s Strategic Plan outlines goals to strengthen excellence in teaching and learning, enhance connection to the local community, and maximize visibility and esteem of the college. Sustainability and climate action are crucial to achieving these goals. 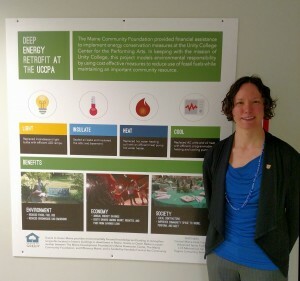 Jennifer deHart at the completion of an energy project accomplished with funding partners, a revolving loan fund, utility incentives, and local vendors. Photo credit: Unity College. As for the value of climate action to increased admissions and student retention, another strategic goal at the college, Unity would like to know more details. The school definitely attracts students that are interested in the environmental mission, but Jennifer wants to know exactly what they are drawn to. “What difference does it make if we retrofit all buildings to be zero net energy? How many students’ families are looking at Green rating tools?” These would be helpful metrics to understand the contribution of climate action to enrollment targets. Overall, Unity is happy with how its environmental focus drives institutional goals and priorities, and would like to continue helping other schools undertake similar efforts. Unity is a small college (under 700 students!) so naturally many of the measures they have implemented are not feasible at larger institutions. However, there are lessons to be learned as to how sustainability can be a framework for virtually all aspects of a college or university. I asked Jennifer what she recommends for sustainability staff at other schools. Look for more information on aligning climate action with your institution’s strategic priorities over the next few months as we work with New England schools on this process. Top photo credit: Unity College hosts the state’s largest environmental career fair, providing professional resources for students and the public interested in energy, management, agriculture, and continuing education in sustainability careers. Photo courtesy of Unity College.